Sunday’s local elections were widely seen as a test of support for Erdogan as the nation of 81 million people faces a daunting economic recession with double-digit inflation, rising food prices and high unemployment. The main opposition party winning the race for metropolitan mayor in Ankara marks a symbolic shift. The capital city was held by Erdogan’s Justice and Development Party, the AKP, and its Islamic-oriented predecessor for 25 years. According to unofficial results reported by the state-run Anadolu news agency, Mansur Yavas, the candidate of the secular Republican People’s Party, or CHP, won the top post in Ankara. The AKP still holds a majority of Ankara’s 25 districts. Speaking from the balcony of party headquarters in Ankara early Monday, where he has for years declared victory, Erdogan said he and his allies had come out first. Admitting setbacks, he said the party would work to understand and fix where they failed. Ballot counts were still underway Monday morning in Turkey’s largest city and commercial hub, Istanbul. Both candidates —Ekrem Imamoglu for the CHP and former Prime Minister Binali Yildirim for the AKP— claimed they had won. The opposition accused Anadolu of bias, and the agency’s unofficial results for Istanbul were stuck at 98 percent of votes counted for hours. The private Demiroren news agency showed Imamoglu leading Monday. The mayor’s seat in the city of 15 million is important. Erdogan’s own ascent to power began there in 1994. The HDP had vowed to win them back. Amid a media blackout and despite significant losses in the region, it regained the municipal mayor in the Kurds’ symbolic capital, Diyarbakir. Government officials have previously threatened they won’t recognize results if HDP candidates with “terror” links win. 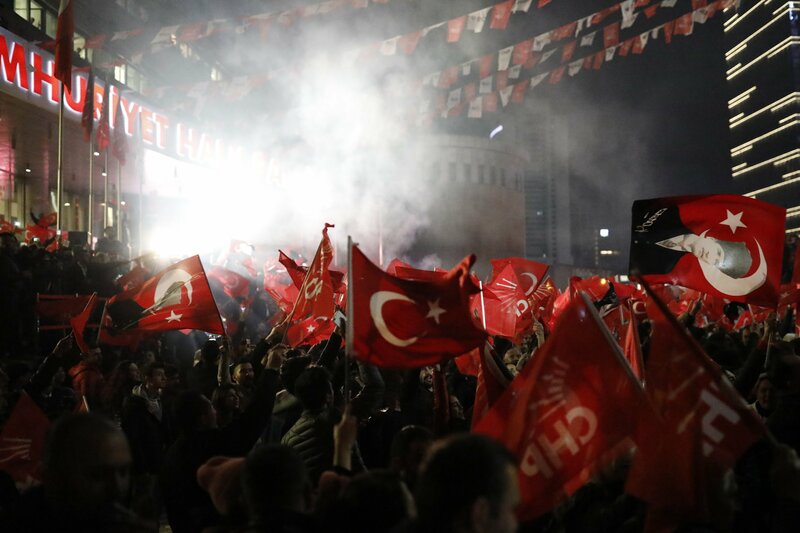 The secular opposition also made significant gains in provinces along the Mediterranean, including taking Adana from the nationalists and the resort-town of Antalya from the ruling party. It also retained its hold over Izmir, Turkey’s third largest city, located on the Aegean Sea. If Imamoglu wins in Istanbul, the opposition will administer the three most populous cities. A strategic decision by the pro-Kurdish party to sit out critical races in major cities may have contributed to the secular party’s increase in votes.